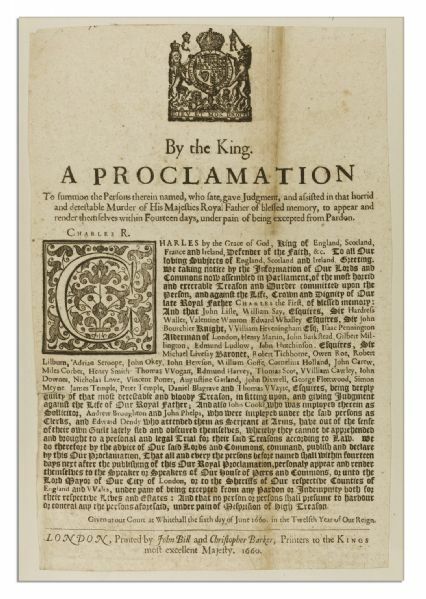 Historically important proclamation by King Charles II from 1660, aggressively targeting those who had taken part in the beheading of his father, Charles I. The Commonwealth of England abolished the monarchy as an institution during its Civil War in 1649, and replaced it with a Parliament under Oliver Cromwell in a period known as the Interregnum. In accordance with the wishes of the people, the throne was reinstated in 1660, and the executed King's son, Charles II, returned from exile in France to rule as King in May of 1660. Broadside is dated one month later, 6 June 1660. With a vengeance for those who aided in his father's regicide, Charles II's Proclamation reads like a most wanted list, demanding: ''the persons therein named, who sate, gave judgment, and assisted in that horrid and detestable murder of his majesties royal father of blessed memory, to appear and render themselves within fourteen days, under pain of being excepted from pardon...'' The proclamation names 44 men charged with treason and murder who were at large. By this time, some of the implicated listed here had died, some were pardoned, and some fled the country, with Dixwell, Whalley, and Goffe famously reuniting in Connecticut. The worst offenders were hanged, drawn and quartered, or imprisoned for life. The Restoration not only provided for the monarchy to resume, but went so far as not to acknowledge its temporary cessation; King Charles II's reign was officially determined to have begun immediately upon his father's death in 1649. 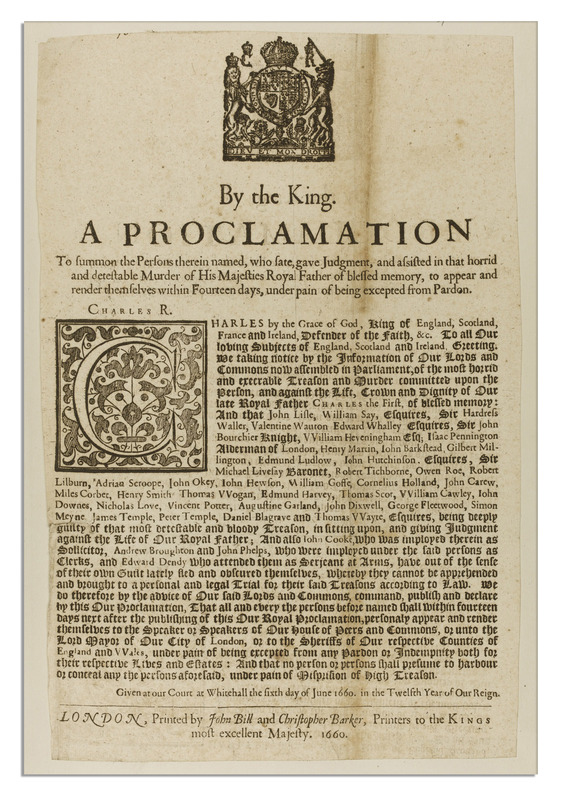 The dating reflects this in a line printed at the bottom: ''Given at our Court at Whitehall the sixth day of June 1660 in the Twelfth Year of Our Reign / Printed by John Bill and Christopher Barker / Printers to our King's most excellent majesty 1660.'' Broadsheet measures 9.5'' x 14.75'', with two ornate woodcut emblems, including a royal arms at top, and a large woodcut initial ''C.'' A browned vertical crease runs through center, else near fine. An important and scarce document from the dawn of the famous English Restoration period.